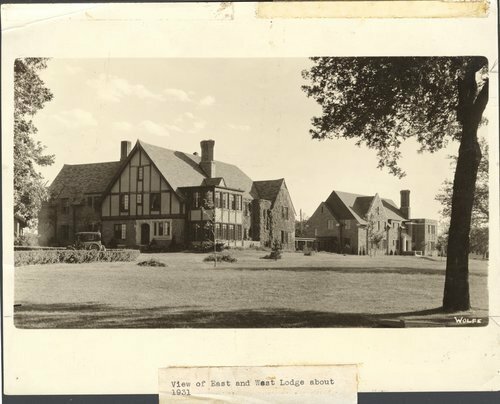 These black and white photographs show the East and West Lodges and connecting pergola of the early Menninger Clinic while under construction in December 1930 and then completed in 1931. The Menninger Clinic as a sanitarium was established in 1925 with the purchase of a farm house and admittance of 12 patients. Their philosophy was that mental illness could be treated with an integrated medical, psychodynamic, and developmental approach for the total health of patients. This was the first construction in the development of the clinic.